Many Bloggers work hard on their blog posts and It feels very bad when they find that someone is copying their blog posts word to word and posting it on other website. And it explodes you when you find that the copied version of your post is ranking high and receiving more traffic. This is very annoying and should be strictly avoided, if you want to be successful then go write your own articles, copying them won't make you successful, Google is way smarter than you think and can easily detect copied texts, if Google finds out plagiarism then your site will get banned from search results and if by any chance your site is hosted on blogger then it will get suspended. So Today I'm posting some websites which will help you find Who is copying your posts, So that you can take action against him. Also Read: How to check if Guest Post is copied before Publishing. Copyscape is one of the Best online Plagiarism checking tool, And a best thing about copyscape is that it also offers free scan. Just go to www.copyscape.com and enter your blog or website URL and finally click on Go. Copyscape will scan the content from your URL and compare it with other post. If it find copied posts or copied paragraphs or anything similar. It will show the websites containing copied content. 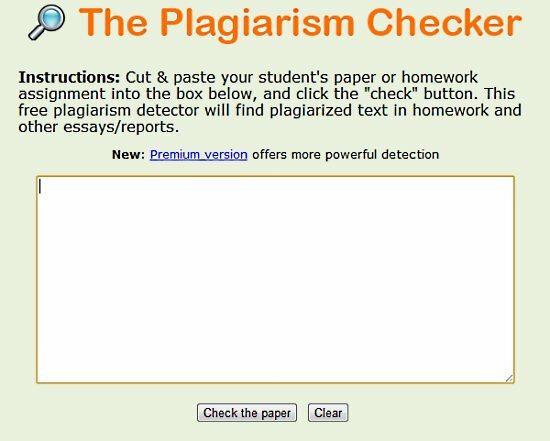 Plagiarism checker is another free online tool to check copied content. A good thing about this website is that it can search individual posts and phrases, So if you allow guest posting, then this website can be useful for scanning guest post. Just go to Plagiarismchecker.com and in space provided, paste content you want to check and hit search. 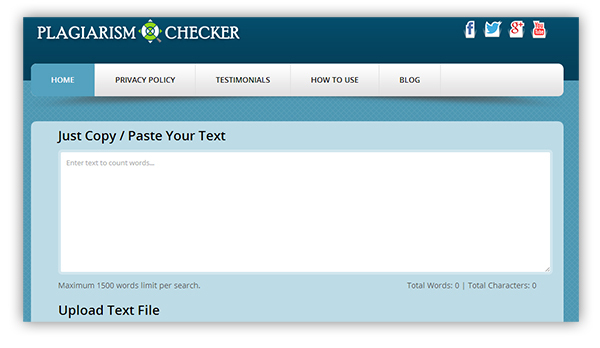 Now after scanning your post Plagiarism checker will display results. This is one of the best Plagiarism checkers I've ever come across, the beauty of this online tool is that it helps detecting plagiarism by copy/pasting the text in the given box or by uploading the document file on their online tool. The results by this tool are quite accurate and in-depth, in few seconds the results will be displayed and you can find out if the content is copied or original. This tool is best for Blog owners as they can detect if guest authors are really writing articles or just copying for the internet. 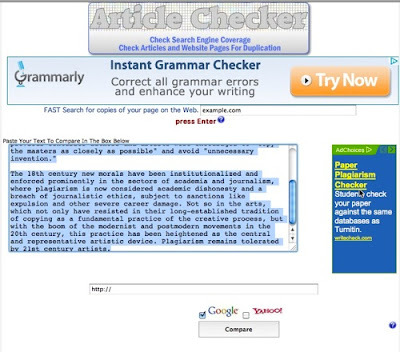 Article Checker is another free tool available on web, The best feature of Article checker are that it can compare results from Google and Yahoo. Another best feature is that it can search both ways. Just like Plagiarism checker, Dupli checker can also search individual posts or paragraphs. Go to Dupli Checker.com and paste the post you want to scan, Now choose search engine you want Dupli checker to search for your content and hit Go. After analyzing Dupli checker will show you results. Dupli checker shows results of each sentence. So you can make sure that the content is safe. 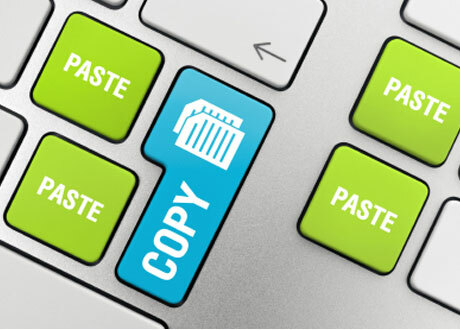 Plagiarism Detect offers various features in Detecting copied content, But one flaw is that it requires an account, You can sign-up for free account. Plagiarism Detect has both free and premium options available. With basic plagiarism checking tool, it also offers uploading a Doc file for checking plagiarism. The File Uploading option supports various formats, Making Plagiarisma one of the best tools available online. This is a simple Plagiarism checking tool, It only offers Copy/Paste option. So just paste the article on region provided and Hit 'Check this paper' button. This tool also offers various methods for checking Plagiarism online. You can check for plagiarism by pasting the article on provided region, By entering URL, By uploading a Text file. The unique thing is that it also offers a sensitivity level. So that you get desired results. So here are some best and free tools to check plagiarism online, I hope you liked this article. Please share it with your friends by using the widget on the left Or Please Leave a comment below. How to check if Guest Post is copied before Publishing.